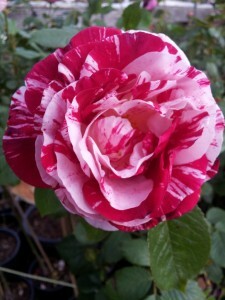 Raised by Tom Carruth, USA, 1999 produces masses of medium sized pointed buds mostly in clusters, and opening with a riot of stripes of burgundy-red and creamy white where no two flowers are exactly the same. Scentimental has an intense spicy Damask rose fragrance and to make a real statement with this rose in the garden, it should always be planted in a group – nobody would ever walk past and keep their mouth closed … this is a real oooh, aaah rose! The bush is very shrubby with large dark green, plentiful and healthy foliage which is rather serrated and very leathery. It is a very rounded shrub and flowers constantly throughout the flowering season. WATER – Roses are very deep rooted plants and require one good, deep soaking at least every 10 days in hot and dry conditions. 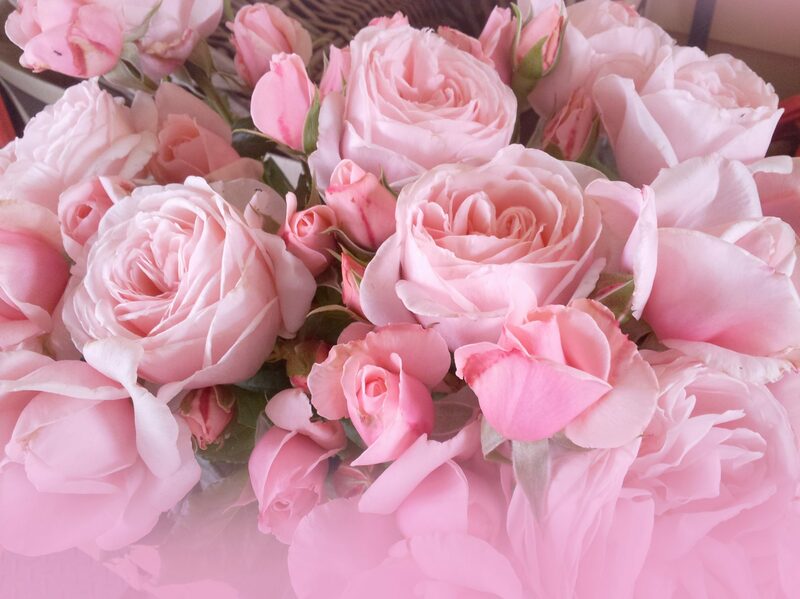 FEED – Because roses flower throughout all but the Winter season, they should be regularly fertilized with quality (preferably organic) fertilizer which contains a balance of major nutrients (NPK) and trace elements. The fertilizer should be applied at least once a month – small amount often – with fortnightly applications of liquid seaweed over the foliage. PRUNE – During Winter, 70% of the rose plant should be pruned and all old wood removed back to the crown and the bush pruned to shape. During the flowering seasons, 25% of all flowering stems should be cut back after flowering to encourage strong re-growth. MULCH – Particular attention to application of lucerne or pea straw directly around the root-zone of each rose will enhance the overall health of the rose and then the whole bed should be mulched to 75mm with any other mulch medium available. I was given a full sized “Scentimental” plant by a woman with too many potted roses and it is still in a large pot. I have had it a year and I keep waiting, but the few roses that it gets do not have any fragrance that I can smell at all! What is wrong with my plant? The Mr. Lincoln, next to it has a heavy scent by comparison. Any suggestions, other having my sinuses checked? I am willing to share cuttings. It tends to have many suckers that I have to keep digging out and recently I have thought about trying to grow it on it’s own root before I put it into the ground. I also was given a “Perfumed Tiger” by the same woman with the same lack of scent issue. Many other of my roses had good fragrances, just neither of these and I can not figure out why. I would love some help or an explanation. Hi … because of the suckering issue with this plant, may I suggest that you toss it away!!! SCENTIMENTAL does indeed have a very beautiful fragrance most times that I take a ‘whiff’ … we all have a different sense of smell and if you take a sniff of MR LINCOLN first, then your olfactory glands are filled with that fragrance. Try and sniff the SCENTIMENTAL first! Whatever you do, don’t take cuttings off the suckers from this plant – that’s not a nice gift for anybody! This happens often when a rose is roughly dug up after growing in a garden bed for some time … seriously, throw it away and treat yourself to a lovely fresh plant … cost you around $20 and worth growing over and over. Not sure about PERFUMED TIGER … have never grown it but I’m assuming it is one of the Delbard roses??? Same with the Delbard roses, depending on the weather, sometimes there is intense fragrance, other times none at all – as with most roses of course!